Edited by Sedrefilos, 15 September 2017 - 02:39 PM. Yeah, I agree. 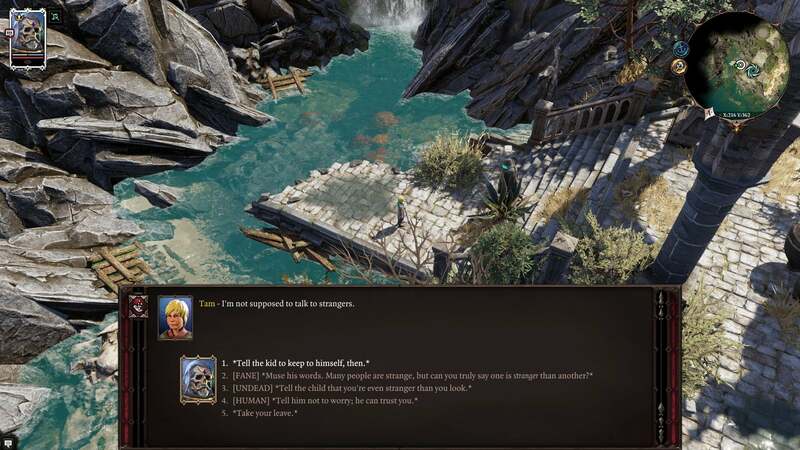 That said I do think the dialogue was in general very good - the only issue I really had with it was a tendency at times to overexpose (see the end of the Skaen quest or the final meetings with Iovara and Thaos as examples), but I believe they are already aware of this and are looking into this matter for Deadfire. The thing that shocked me with DOS 2, because i hadnt looked at any playthroughs and read any info, was my characters own voice. I thought the game was messed up at first when I talked with the first npc and i didnt have any dialogue just what seemed to be placeholders. Dont love that but the game seems fun so far. I dont actually care if the game is fully voiced and if like others have said the options suffer or dialogue suffer because of voice acting i dont love it. I am sure POE2 will be fine though they are already promising more voice acting so im good. Edited by draego, 16 September 2017 - 08:23 AM. "John: Imagine knowing someone else and having enough overlapping time. Imagine such a world. I need to share the strangeness of voices being added in this released version. The alpha had just text, which was odd at the very start, but then settled in to normality for me – indeed, even your Pillars and the like are only sporadically spoken. But now everything and everyone has a voice, and because I’ve already met them, THEY’VE ALL GOT THE WRONG VOICES. It’s such an odd experience, like watching a film of a book you read and their matching nothing of how you’d imagined it. Adam: I’ll turn off the voices. I’ll take out my headphones and unplug the speakers if I have to. If voice acting isn’t absolutely top notch I’d rather go without it, and I have very exacting standards. And it’s not even just about quality, as you say, it’s that I already know a lot of these characters. But there’s another level as well: the writing is brilliant. It’s witty and it’s clever and occasionally it’s even quite moving as you come to the end of some of the major plotlines that have their hooks deep into characters you’ve come to care about. But so much of that writing feels like it was constructed to be read from a page (or screen) rather than performed. John: Yeah, it’s very pleasant to read, in a way RPGs really usually are not. It’s not turgid purple prose lore guff nonsense, but pleasing writing. I think it’s a bit less pleasing to listen to. Which isn’t a slight at (most of) the voice actors (the person who did the little girl elf’s voice can maybe not do that again please), but more that – I dunno – I don’t think I’d even consider switching it off if I hadn’t played the alpha. Still, clicking past it as I read right now." Ye there are lots of choices. I was referring to the way your choices are presented. They are trying something different within the dialogue options at least to me in games like this. When you talk to the npcs your choices describe what you are saying not what you are actually saying. it was just odd when i first played. Edited by draego, 16 September 2017 - 07:52 PM. Yes, and this is the main problem with my suggestion. No company wants to add a feature to their game that could be percieved as 'bad' and not up to par with the rest of the product. And there's no good way to explain it to all the players why it's there. One possible solution to this would be to make it an option that you have to switch on manually from the settings panel or if that's not enough - make it into a small patch addon that you have on your website, and anyone who wants the feature can just download it for himself. All in all it is kind of a big risk on their part and it's understandable if they don't want to do it. And I'm sure there will be more/ better voice acting in the second game. But it is worth considering that all the people who put down the game, because - "there was too much reading for me", if you can bring back 10-20% of those people with this optional thing, then I call that a win. That's... interesting. I am not sure how I feel about it, but it might have its benefits. Reminds me of the choose your own adventure parts from PoE. Again, all this is to support the co-op and pen and paper/DM mode styles/options of the game without alienating the majority of single-players. It was weird when I first saw it too, but if you see the description is almost a straight line you could say. When you play with friend(s) you may add some roleplay into thet. That kind of descriptive answers help. I'm OK with that. Also, when I was saying about the setting being ultra high fantasy in conbination with the writing, I meant the subjects you're experienceing/talking in the game. In the context of talkig about who's gonna ascend as the next Divine, the writing and dialogues are very very good imo although it doesen't mean it's not dealing with more realistic/grounded subjects. DOS 2 tries stuff, new stuff, different stuff, interesting stuff. In terms of aethetics and feel it is more like a "grounded" Warcraft, like Pillars is like a "grounded" D&D. It is open-world/sandbox and a completely different experience that Pillars and it should't be copared to it imo. DOS 2 has all rpg elemnets that rpg players love and that's a fact. Now, if the story, aesthetics, voices and way of writing isn't of personal prefernce of someone, this is a totally different subject - the important thing is it ticks all rpg boxes and I'd recomend it to any gamer who cares more about these. Edited by Sedrefilos, 17 September 2017 - 07:05 AM. It's a win win if you can afford it, maybe, though I'd be genuinely interested to see how many people consider the trainwreck VA of the narrator added value. Larian have quite clearly squeezed every penny they have (and don't have) and risked the whole company, banking on bringing in the kinds of gamers for whom stuff like full voice acting is a dealbreaker. I hope they succeed, and I'm glad I can turn off the absolutely awful narrator, but that's not a "win-win situation" as if there are no costs or risks involved and that everybody should do it as a matter of course. Edited by Tigranes, 17 September 2017 - 08:39 AM. Edited by Sedrefilos, 17 September 2017 - 09:42 AM. In the end, I'm really quite conflicted about that whole concept. On the other hand, not all voice acting is going to be good. And in those cases, when the voiceover doesn't really contribute to the experience, I'd rather just read the text. And if I'm reading, voiceover is a real distraction. I read a lot faster than the guy talking, so I either impatiently follow his pace, or try to ignore him and shut him up mid-sentence by clicking on. Both don't help the mood of a situation. I just made a thought: apparently being a native english speaker makes a big difference in english voice acting. If your native language is english, you can easily skip faster through text and don't mind the voice, especially if it doeasn't say much to you. For me, a not english native speaker, it helps more when it comes to massive lines of reading. So since I've been playing Divinity Original Sin 2 I see just how great it can be to have full voice acting, including a narrator. Their voice talent is good too, it isn't sub par stuff. I think full voice acting would make the game much more accessible without compromising at all in the complexity or writing department. Of course I don't know what the word count is of Deadfire compared to DOS 2, maybe it is large enough to make the difference, maybe the budgets and expected sales of the two are just that different. I know if I could choose I would prefer full voice acting. I hear you on DOS's VO. Have you played DOS 2 yet? The VO and characters are significantly better. Edited by Mygaffer, 17 September 2017 - 07:11 PM. I care about companies like Obsidian and Larian, and it's not your place to tell me I shouldn't care, is it? That said, if you're talking about the consumers enjoying the best product they possibly can, I personally don't think voice acting adds value to 90% of games and I think any form of resources or priorities spent on it are better spent elsewhere. If you think people are "just" against VO then (1) you haven't been reading their arguments, and (2) you think somebody wakes up one day with some random hatred of VOs. It has been very well documented by many devs how costly VO is; how hard it is to get it to acceptable quality; and how, if not in all games, then in many RPGs over the years, it constrains the word count and prevents writers from having enough editing rounds. (You see one funny consequence of this in DS3's opening, which was voice recorded and then it was too expensive to redo VA when they wanted to change the script, so they ended up with a subpar script that still fitted the new storyline but ended up repeating "JEANNE KASSYNDER" (or whatever the name was) like 18 times in this spliced dialogue.) It also sets up additional barriers for lower budget / indie games to reach what many players demand as acceptable polish. I and some people also just prefer not having VA unless it really works well with the rest of the presentation and it is done really well. There are many reasons that rational consumers have developed their opinions about VO, many of which are well grounded in industry realities or their own preferences. I can't help you if you insist that I can't care about certain things to qualify as a rational consumer, or that facts about how VO impact development well documented (no, I'm not going to look it all up and give you citations) must be pure speculation, or whatever. I respect your right to your opinion, of course, about your own preference for VO. DOS2, from a couple hours play, seems to have decent VO, everything except the awful narrator seems pretty OK. Nothing memorable or quality but nothing poor that detracts from the experience.